As we move forward into the year 2004, we are working within the limit of a frame of the timeline of destiny for the present world order of Satan’s power and dominion. Drawing a reference point to the subject of "A Lion in a Cage," which contains within its context the word "age,"
Spiral Galaxy imaging the All Eye Seeing of Allah, as reflected in the heavens above. we are given several mathematical figures to study, which describe the spiritual condition of a people, of the Black Nation, who were forced into servitude slavery by strangers living in a strange land called America. This forced servitude slavery has endured for over 400 years to the present count of 60 minutes in an hour, of 24 hours in a day, and of 365 days in a year. When these figures are added up, (60+24+365), their sum is 449, which is exactly the number of years of our captivity to this year, 2004. The Book of Revelation, the last book of the Bible, gives us a prophetic picture of this history of toil and affliction, which has affected the entire population of the Planet Earth. In the 5th Chapter of Revelation, The Throne of God is revealed and the work of the 24 Scientists or Elders who sit in the circle of the Most High God. 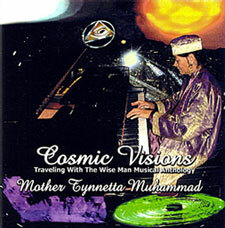 Music CD cover of Mother Tynnetta Muhammad�s original composition performance on piano entitled, "Cosmic Visions." According to this prophetic picture, a strong and powerful angel appears who speaks with a strong voice and weeps much because no man was found worthy to open and to read the scroll or neither to look thereon. "And one of the elders saith unto me, Weep not; behold the Lion of the tribe of Judah, the Root of David, hath prevailed to open the scroll, and to loose its seven seals." According to the further description of this one mentioned in the 5th Chapter of Revelation, he appears in the midst of the Throne and of the four living creatures, and in the midst of the elders appearing as a Lamb as though it had been slain. "And he came and took the scroll out of the hand of him that sat upon the throne." Let us say that the opening or breaking of the seals of the Book may imply the removal of the rusty locks that has accumulated on our brain cells, over the long centuries of being tortured and deprived of the Light and the Life and the Knowledge of Ourselves, our Original People and Our God. As a result, it took a Powerful Being, an Angel, or God, Himself, to come and to redeem us and restore us back to our God and to our People, having been lost, and in all appearances as dead and slain from the foundation of the world. If this analogy is true, then who is the King and who is "The Lord of the Rings?" If the door of our confinement has been opened, then what is the limit of the time given by the ancient prophets or seers for our delivery from the ring of fire that encircles the caves and hillsides of darkness in this land of America? In the training of the feline or cat family which includes cougars, tigers and lions, they are often trained to jump through a circle or ring of fire, to show their bravery, courage and resourcefulness in escaping danger in captivity. Thus, the lion is stylized as the King of the Jungle, most fit for survival. In many ways, the Black Man’s History through the ages has demonstrated this enormous ability to survive against all odds. In J.R.R. Tolkien’s trilogy, "The Lord of the Rings," it is this mastery of survival in difficult and strange environments and habitats—even within the bowels of the earth, in underground tunnels, caves and hillsides, within hidden passageways and in rugged terrain—that makes man the greatest of God’s Creation to become gods and children of the Most High. Thus, the True King Returns in His Glory, as the Lamb that was slain, to receive power, riches, wisdom, strength, honor, glory and blessing.